Wayanad, enriched with beautiful flora and fauna is an exotic tourist spot located in Kerala. This picturesque place lying in northern Kerala attracts lots of visitors from all over the globe. These exotic places plays a key role in promoting and maintaining Kerala tourism and welfare. In this article, you are going to see about the details of some of the exciting tourist spots in Wayanad district of Kerala. It is an alluring tourist spot located in the northern part of Kerala grabbing thousands of visitors from all over the globe. This tourist spot beholding a wonderful collection of attractive places plays a leading role in promoting Kerala tourism. Now, let' see the details of some of the best known tourist places at Wayanad region. It is one among the best tourist places coming under the list of Wayanad tourism. Neelimala is a perfect location for trekking lovers. Great view of Meenmutty waterfalls and beautiful valley from the top of Neelimala view point is really amazing and astonishing. Neelimala lies close to Vaduvanchal in Neelimala and attract lots of tourists. It is a notable region for enjoying sightseeing in Wayanad region. 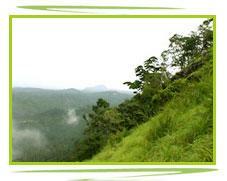 If you wish to enjoy an enchanting view from the highest peak of Wayanad, this location in Wayanad is a perfect spot. Chembra Peak is consideredf as the highest peak in Wayanad district. It is one of the favourite destinations of trekkers. District tourism council provides all necessary facilities needed for trekkers. Spectacular view of Wayanad district from Chembra peak captures all eyes of tourists. Meenmutty is consisdred as the largest waterfall located in Wayanad district. Great view of Meenmutty cascading in three stages delivers a feast for visitors eyes. The word Meemnutty literally means blocking of fish. It describes the nature of waterfalls blocking even fish movement. Kanthanpara waterfalls is one among the beautiful spots in Wayanad district. It is located 22 kms south east of Kalpetta. Alluring green scenery of Kanthanpara waterfalls relieves all your tension and makes you well relaxed. It is about 30m in height and provides an astonishing view for visitors.